Every year Pharma Intelligence attends the American Society of Clinical Oncology conference. Just in time for your 2018 ASCO Annual Meeting planning, join analysts from Datamonitor Healthcare, Biomedtracker, Citeline, Scrip, and Pink Sheet for their expert opinions on what you need to know to get the most from the meeting. Let our experts present their top picks from the thousands of abstracts being presented at ASCO. For some years now, immunotherapy has dominated the American Society of Clinical Oncology (ASCO) annual meeting and this year is no exception as it will be a defining week for PD-1/L1 inhibitors and chimeric antigen receptor T-cell therapies. Biomedtracker uniquely allows subscribers to stay on top of key meeting developments, even when attending in person isn’t possible. Our expert staff continually reports on the most salient and crucial aspects of meetings and is available to assist subscribers with their questions. Keep pace with breaking events, upcoming milestones, and their impact on the markets you care about with Biomedtracker. Thanks for your interest in the 2017 Informa Pharma Intelligence Post-ASCO Podcast, your digital audio wrap-up of the most impactful presentations and posters at the 53nd Annual Meeting of the American Society of Clinical Oncology (ASCO), June 2-6 in Chicago, Illinois. Featuring analysts from Informa’s Biomedtracker, Datamonitor Healthcare, and Citeline, the 2017 Informa Pharma Intelligence Post-ASCO Podcast provides commentary into the major events from ASCO 2017: what delivered, and what failed to live up to the buzz. This podcast is one of the many ASCO-related materials available to subscribers of Biomedtracker. With Biomedtracker, stay on top of key developments, even when you can’t attend a meeting. Our expert staff continually reports on the most salient, crucial aspects of meetings, like ASCO, and is available to answer any subscriber questions that may arise after reviewing meeting materials. Keep pace with breaking events, upcoming milestones, and their impact on the markets you care about with Biomedtracker. 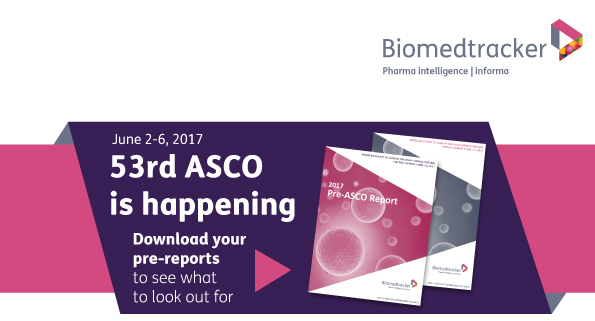 Every year the Informa Pharma Intelligence experts analyze the finding that come out during the ASCO annual conference. This year we are delighted to have Dr. Peter Lee from City of Hope Comprehensive Cancer Center weighing in with our analysts on the key takeaways from this year’s conference, its winners and losers, and examine the implications for the future oncology treatment landscape. Ally Bruce is a Principal Analyst in Oncology and is part of the Citeline team. She has been an Analyst with the group for over a decade, with experience in Oncology, CNS, and Analytics. Prior to Citeline, she was a healthcare consultant in Cambridge, MA, and spent several years coordinating clinical trials in the Psychopharmacology Unit at Tufts Medical School. Zachary McLellan is an Analyst with Datamonitor Healthcare specializing in the coverage of breast and gynecological malignancies. Zachary has a M.Sc. In Biotechnology and Entrepreneurship from New York University and worked as a chemist prior to joining Informa. Robert Jeng is a Senior Scientific Analyst overseeing BioMedTracker’s oncology coverage for the past 5 years. Before joining Informa, Robert was a cell biologist who earned his Ph.D. from Stanford University before working as a postdoctoral researcher at Berkeley and a staff scientist at the Sanford-Burnham Institute specializing in cytoskeletal dynamics. Peter P. Lee, MD is Chair, Department of Immuno-Oncology and Billy Wilder Endowed Professor in Cancer Immunotherapeutics at City of Hope Comprehensive Cancer Center, CA. He also serves as Co-leader, Cancer Immunotherapeutics Program and Professor, Department of Hematology & Hematopoietic Cell Transplantation at COH. The focus of his research is on understanding how cancer impacts host immune responses in patients, with the goal of developing novel treatments to restore/enhance immune function in cancer patients. His group aims to dissect the complex interplay between immune/stromal cells and cancer cells within tumors, tumor-draining lymph nodes (TDLNs), and blood using experimental and systems biology approaches. His group has shown that lymphocytes from patients with breast cancer, melanoma, and colorectal cancer develop immune signaling defects that blunt their proliferation and function in vivo. He is also extending these findings in multiple directions, including to other human cancers such as prostate cancer and leukemia. Dr. Lee has published over 50 articles in journals such as Nature Medicine, Proceedings of the National Academy of Science (PNAS), Public Library of Science (PLoS), Medicine, and received many awards, including elected member of the American Society for Clinical Investigation, Department of Defense Era of Hope Scholar Award for Breast Cancer Research, American Cancer Society Research Scholar, and the Damon Runyon Scholar Award. While a fellow at UCSF, Dr. Lee invented the MucoCept technology. Our NEW white paper allows you to read through the results and implications of these key abstracts, chosen by our expert analysts, allowing you and your business to evolve with the oncology market. As Bayer prepares for several of its key products to lose patent exclusivity in four to five years’ time, In Vivo caught up with the company’s new head of pharma, Stefan Oelrich, to hear more on his strategy for the future – especially his plans for drug R&D, collaboration and a pipeline built on external innovation. In four days before Scott Gottlieb's stint as commissioner ended, FDA announced official start of initiative to consider regulatory pathways to make CBD compliant as a dietary ingredient, launched another shot across kratom sector's bow and noted more examples of e-cigarette marketers crossing regulatory lines. QUOTED. April 26, 2019. Jeff Shuren.